Stroll across from St Paul’s Cathedral towards Paternoster Square, and you will find a treasure rebuilt. A Londoner may recognise it from all the old engravings in which it took centre stage. It is Temple Bar, distinctive and ordered, unlike so many of our gruff flint thuggish city gates. In fact, it is likely to have been designed by St Paul’s Architect, Sir Christopher Wren. But I didn’t recognise where it was at all. All the engravings I have seen show it as a bar which stood sentry to ancient London. In the middle ages, as the settlement grew, the old city gates did not mark the end of business any longer. The City of London Corporation acquired powers to reach beyond London’s walls and charge tolls to merchants who were technically outside. The most lucrative of these was Temple Bar. It marked the westernmost point, where Fleet Street became the Strand. And it made its money through the incessant back and forth from the financial capital – the city – to the political capital, Westminster. According to the City of London Corporation of today, the first mention of the Bar was in 1293. At that time it seems to have been a chain or bar between two posts. Named after the nearby Temple law courts, it soon developed into a multitasking timber gateway with a handy prison on the top. 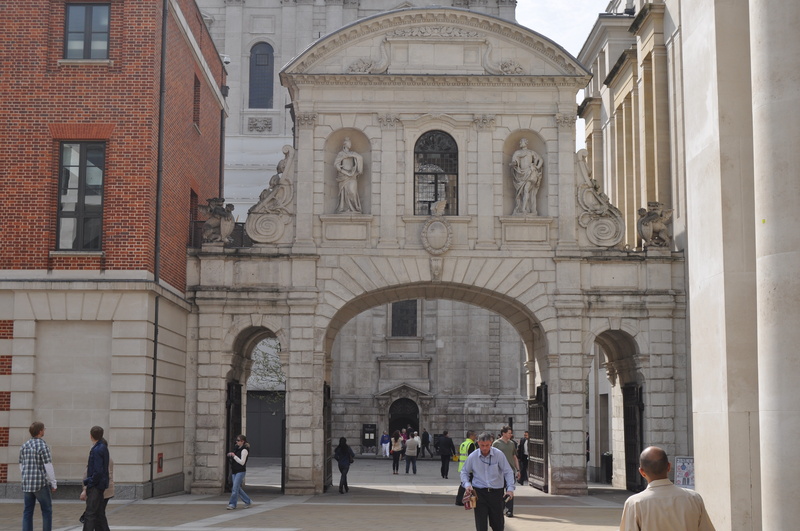 The wooden gate survived the fire of 1666, but it was old and dilapidated, and Christopher Wren’s new London would have grown sniffy at its old incarnation. So a new one was built. It has Wren’s look, this gracious, light gate of such classical proportions. For 200 years, it graced the point between Fleet Street and The Strand. But eventually, the very hordes of traffic which had made its position so lucrative ensured its downfall. The junction of these two roads was just too busy. The tiny gate caused traffic to back up disastrously. The Corporation held out as long as it could; it had such an affection for this landmark. But in the early days of January, 1879, they relented. They took it apart, stone by stone; they numbered each stone with infinite care; and they took it round the corner, to a warehouse in Farringdon Road, until they could consider its future. And this is where the history of Temple Bar takes a bizarre twist : and all at the behest of a banjo-playing barmaid. Val Reece claimed to have been an actress before her marriage. But there are dark whisperings of a much less salubrious career in an establishment in Holborn. She was a well-endowed, raven-haired beauty who caught Whistler’s eye and sat for three of his portraits. There is an untold story here, because secretly, and in a great hurry, Val got married. She chose for her consort New Money: a brewer and Member of Parliament, Sir Henry Meux. She was a sight to behold around London, riding on a high phaeton drawn by a pair of zebra. Just months after Temple Bar’s dismantling, she acquired it and transported it, stone by stone – 2,500 stones weighing around 400 tonnes – to Sir Henry’s home, Theobalds, in Hertfordshire. Was it her gateway to society? It is said that she used to hold select dinner parties in the upper chamber of the bar. It was, it seems, decorated with “spy” cartoons from Vanity Fair. Here she sat with the likes of Edward VII, and Winston Churchill. Society certainly came to sit in her gateway. The latter part of the twentieth century was not kind to Temple Bar. Theobalds fell into disrepair and one of London’s chief city gates sat, forgotten, amongst the weeds and overgrowth. In 1976, the Temple Bar Trust was set up. Its aim: to return the bar to the capital city. And after years of campaigning, in 2001 the Corporation agreed to help the Trust make up the £3 million it would take to return. It opened on November 10 2004. Exploring the area round St Paul’s. I found it at the entrance to a swish new development at Paternoster Square, once more an uncommonly handsome bar, the wonder of all who survey it. I stared along with everyone else in wonderment. But I thought, hold on, how did that get there? I wonder if somewhere deep in its stonework, it is every bit as bewildered as me? This is a repost: Temple Bar is one of my favourite London stories. If you’re ever in London: do pop along to see it…..
Posted in London, Places to visitTagged england, heritage, history, London, Peternoster Square, Temple BarBookmark the permalink. So funny that the traffic in the 1800’s was too hectic. Wonder what those people would think of London traffic now? Nice story. I’d imagined Val Reece to be a character from Rowlandson’s time until I saw the time line of Edward VII and Winston Churchill. 1847-1910, Roger. Churchill would have been a whippersnapper I would have thought: but we know he had many incarnations before becoming Britain’s Prime MInister. The Monastery of St. Bernard de Clairvaux was built in Sacramenia, in the Province of Segovia, Spain, during the period 1133-1141. It was originally dedicated in honor of the Blessed Mother and named the “Monastery of Our Lady, Queen of the Angels.” Upon the canonization of the famous Cistercian Monk, Bernard of Clairvaux, a leading influence in the Church during that period, the Monastery was renamed in his honor. In 1925, William Randolph Hearst purchased the Cloisters and the Spanish Monastery’s outbuildings. The structures were dismantled stone by stone and shipped to the United States. The stones were placed in a warehouse in Brooklyn, New York, for 26 years. In 1952, they were purchased by Messrs. W. Edgemon and R. Moss to create a tourist attraction, and the Spanish Monastery became a landmark in Florida history. This is the oldest non Native American building in the US, 2 miles away from where I live. Fantastic, Carl. I’d love to see some pictures. I love stories like this where historical monuments are painstakingly rebuilt in places that can accommodate them and be available for all to see. However, when the London Bridge was moved to Arizona, it just seemed to surreal. London Bridge is a bridge in Lake Havasu City, Arizona, United States, that is the relocated 1831 London Bridge that spanned the River Thames in London, England until it was dismantled in 1967. The Arizona bridge is a reinforced concrete structure clad in the original masonry of the 1830s bridge, which was bought by Robert P. McCulloch from the City of London. McCulloch had exterior granite blocks from the original bridge numbered and transported to America to construct the present bridge in Lake Havasu City, a planned community he established in 1964 on the shore of Lake Havasu. The bridge was completed in 1971 (along with a canal), and links an island in the lake with the main part of Lake Havasu City. There are a lot of gatehouses like this in England, Rafael. The one at the top of Winchester high street houses a tiny museum. And the one which used to be the gate to the old Reading Abbey was the place where Jane Austen went to school. A whole school inside a gate? That changes my whole perspective on old cities. It would make for an interesting fantasy setting. And everything is new again. I love the rhythm of your writing. When I sit down to read you I immediately feel comfy. Chris, what a wonderful thing to write. I cannot imagine a higher compliment. Thank you. You are more than welcome, Debra. And one day I shall get to see the wonders of Californian history, which I read avidly in your blog. All the world’s a stage. The Bristol gate I used to pass every day on the bus going to school; I always assumed it was the old Temple Gate, but that was apparently demolished in the early 19th century, so not sure what this is. Probably an 18th-century Gothick folly. It’s a mystery, Chris 🙂 I must potter off and see it when I am next in the area.There’s a listed building list here: http://www.britishlistedbuildings.co.uk/england/bristol/bristol -any of these locations look familiar? I love when you open the archives! So many treats. The images here are so great, I got caught up in Val and stopping really considering the effort of moving the gate about England. The images brought me back to the point. There’s something about gates that incite the imagination, and you did not disappoint. It’s still a gateway to the imagination,eh? I love old structures and the tales that go with them. I always say this, but the things they have been witness to over the years…! Those old Londoners should try Piccadilly Circus for a real taste of hectic travel. I love that they repurposed the Temple Bar’s stones.